Screenshot from the video. Watch the interview at the bottom of the article. Media bias can manifest in a variety of ways. Selective omissions, lack of balance, and errors that seem to favor one side are common. In television news, journalists can, in addition, betray their bias with their voices, facial expressions, and gestures. 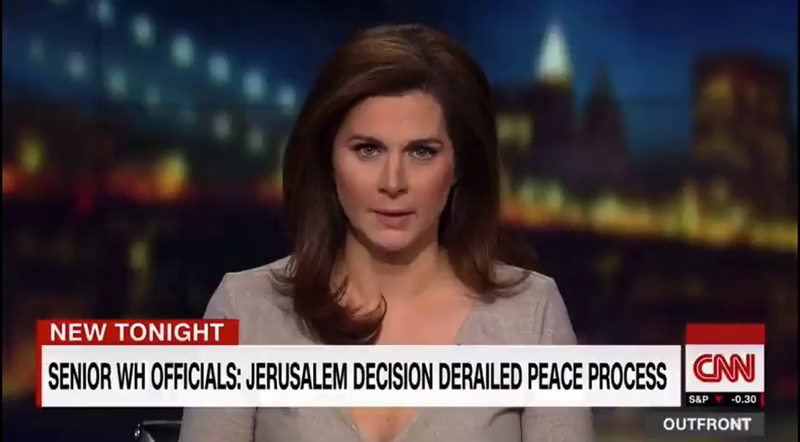 CNN news anchor Erin Burnett’s December 6 interview with Israeli Ambassador Ron Dermer, following President Trump’s recognition of Jerusalem as the capital of Israel, was a case study in a journalist’s expression of personal bias. None of Burnett’s questions to Dermer were, in terms of content, out of line. It’s reasonable to ask about the Arab response to the announcement, the effect on the peace process, and even a video clip in which Dermer appeared to be reacting to a gaffe made by the US President. Throughout the interview, however, her tone, and at times her language, is hostile and accusatory. Look I know this is a day you have wanted for a very long time and I know it matters a lot to you. That is important. But, of course, the situation that we’re seeing now is crucial, the State Department warning of violence because of the move, leaders of countries throughout the region, across Europe, warning of violence, Palestinians calling for three days of rage. A crucial question for you tonight, Ambassador: are you willing to accept violence and the possible death of Israelis in exchange for getting what you have so long desired? Burnett announces that Palestinians have called for “three days of rage” as though national leaders calling for violence is the most natural thing in the world. She doesn’t seem bothered by it, nor does she ask whether they should call for peaceful protests instead of “rage.” Instead, both her language and the accusatory tone directed at Ambassador Dermer imply that any violence that occurs is the fault of the government that the Ambassador represents. Similarly, her facial expressions during his response betrays her skepticism of anything he said. Two senior US White House officials are telling CNN that this decision has temporarily derailed the peace process. And as you know, Ambassador, the Palestinian Authority President Mahmoud Abbas saying Trump’s announcement means the United States has completely withdrawn – completely withdrawn – its role in mediating the Middle East peace process. Once again, Burnett’s accusatory tone suggests that the Palestinian reaction to the US President complying with US law is the fault of Ambassador Dermer and the government he represents. Watch the video. 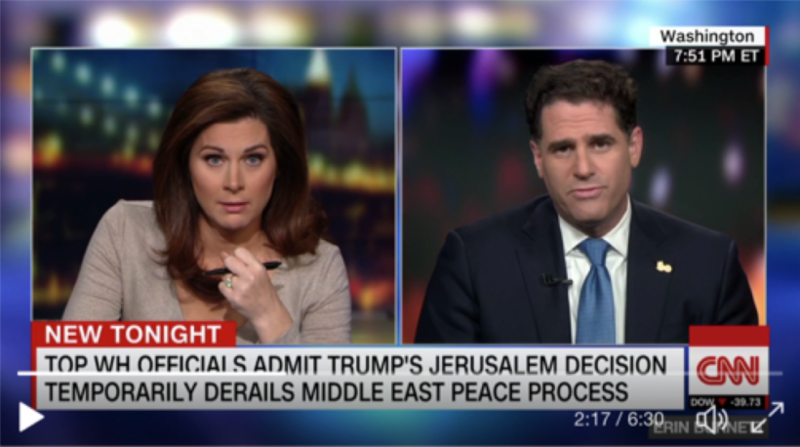 What do you think of CNN anchor Erin Burnett’s tone when interviewing Israeli Ambassador Ron Dermer? 2. Also from the post: “Burnett announces that Palestinians have called for ‘three days of rage’ as though national leaders calling for violence is the most natural thing in the world. She doesn’t seem bothered by it, nor does she ask whether they should call for peaceful protests instead of ‘rage.’ Instead, both her language and the accusatory tone directed at Ambassador Dermer imply that any violence that occurs is the fault of the government that the Ambassador represents. Similarly, her facial expressions during his response betrays her skepticism of anything he said.” Do you think this is a legitimate assertion? Explain your answer. 3. The post concludes with: “Burnett’s antipathy, however, is conveyed to viewers, who will come away from the segment with the subtle message that Israel, again, is to blame for the violence against it, and Israeli government officials are not to be trusted.” Do you agree or disagree with this assertion? Explain your answer.